Over the course of their careers, many registered nurses make the choice to pursue a particular area of specialization. This can prove to be a wise move, as specialization often leads to a higher salary, stronger employment outlook, and increased job security. What’s more, choosing a specialty can give you more autonomy in your job and enable you to pursue the area of work that you’re most passionate about. Sound appealing? If so, it may be worth considering what area of nursing specialization would be the best fit for you. Start by considering your skillsets, interests, and how much additional education you’re willing to pursue—and keep in mind that in nursing, more education generally correlates with higher compensation. To help you along the way, we’ve compiled a handy list of the top 10 highest paying RN specialties to guide you in making an informed decision. We’ve included information about the job duties and educational requirements for each specialty, as well some tips on the personality types that generally thrive in each role. We’ve also created a chart with the average salary, educational requirements, and job outlook for each specialty, so that you can make a direct comparison between the different options at-a-glance. Ultimately, we hope this post provides you with the information you need to make the best decision for your future career. As advanced practice registered nurses (or APRNs), nurse practitioners enjoy a great deal of autonomy, strong job outlook, and high demand. With their specialized education and clinical training, nurse practitioners often perform many of the same functions as primary care physicians. This includes providing direct patient care, performing examinations, and prescribing medications, while maintaining an emphasis on disease prevention and health management. NPs do not require the direct supervision of a doctor and usually, have their own clinics or offices where patients can seek consultations. Due to these specific responsibilities, becoming a nurse practitioner requires leadership skills and confidence, as well as plenty of compassion and interpersonal skills. In general, nurse practitioners are well-compensated and highly sought-after. In fact, the U.S. Bureau of Labor Statistics reported that nurse practitioners earned a median salary of $103,880 in 2017. The job outlook for this position is also much higher than average, with employment expected to grow by 36% between 2016-2016 vs. just 7% for all other occupations. With all of these benefits, it’s easy to understand why many RNs choose to pursue a specialized career as a nurse practitioner. However, additional education is required, including earning a Bachelor of Science in Nursing (BSN), a Master of Science in Nursing (MSN), and passing a national certification exam. If you’re interested in pursuing this career path, Ameritech can help get you started with our flexible RN-to-BSN Degree Completion program. Specifically designed for working RNs, our online program lets you earn your BSN degree on your own schedule at a fixed cost. We even offer special scholarships to our RN graduates to make earning your BSN more affordable too. Nurse anesthetists take on a high level of responsibility and are compensated accordingly. In fact, a CRNA is generally considered the highest paying nursing specialty. In a report from May 2017, the Bureau of Labor Statistics stated that nurse anesthetists earned a median annual wage of $165,120, with nurses in top-paying cities and states bringing home as much as $288,780 a year. This nursing specialty also boasts a higher than average job outlook, with employment expected to grow by 16% between 2016-2026 compared to just 7% for all other occupations. CRNAs are responsible for preparing and administering anesthesia to patients in collaboration with surgeons, anesthesiologists, and dentists. They ensure that patients are prepared for the induction of anesthesia and gauge their response to it before, during, and after an operation. Due to these specific job demands, the CRNA profession is a good choice for individuals who work well under pressure, can adapt to changing circumstances, and are comfortable with a great deal of responsibility. Unsurprisingly, this highly-paid, high stakes position requires extensive additional training. According to the American Association of Nurse Anesthetists, it takes a minimum of 7- 8.5 years of education and experience to become a CRNA. If you’re interested in pursuing this nursing specialty, you’ll need to earn an MSN degree or Doctor of Nursing Practice (DNP), get hands-on practice in acute care, graduate from a nurse anesthetist school, and get certified. While that list may sound extensive, many CRNAs find that the rewards more than make up for the requirements necessary to do the work. According to many employed in the field, Certified Nurse Midwives perform some of the most rewarding work that the nursing profession has to offer. Working alongside OB/GYN physicians, CNMs help provide a wide range of health and wellness care to women, including performing gynecological examinations, providing family planning guidance, and assisting with pre- and post-natal care. Of course, certified nurse midwives also assist with births, helping patients manage their labor and safely give birth to babies. CNMs have been found to perform a valuable service, both to their patients and to the healthcare field as a whole. In fact, a 2011 study in Nursing Economics found that births led in collaboration with midwives are less likely to end in a cesarean than births led by obstetricians alone. Midwives can also provide emotional support throughout the process of childbearing and help new mothers with follow-up care and education. According to a report from the Bureau of Labor Statistics from May 2017, the median annual salary for certified nurse midwives is $100,590, with top earners bringing home as much as $147,820 per year. It also boasts a higher than average job outlook, with employment expected to grow by 21% between 2016-2026 compared to just 7% for all other occupations. To pursue this career path, you must be trained in both nursing and midwifery by earning a master’s degree in nursing and getting certified by the American Midwifery Certification Board. Pediatric nursing requires a special skillset. To provide excellent medical care for children from infancy to their late teens, pediatric nurses must be well-versed in how to communicate with children and ease their fears. They must also be adept at the art of physical assessment, since young children often cannot verbally communicate their feelings. Nurses who specialize in pediatrics perform physical examinations, measure vitals, and take diagnostic tests. Prevention and health education are also an important aspect of the profession, as pediatric nurses play a significant role in educating parents and caregivers about their children’s health. The specific duties of a pediatric nurse depend on the work setting, which could be a pediatric ward, pediatric ICU, surgical center, doctor’s office, school clinic, or other health care setting. Although you do not need a Master’s degree to become a pediatric nurse, many choose to pursue their BSN degree, as it can make you eligible for higher wages and more leadership and management opportunities. If this is a career path you’re interested in exploring, you’ll need to first gain experience working with children as an RN, then get certified by the Pediatric Nursing Certification Board or the American Nurses Credentialing Center in order to become a pediatric nurse. A clinical research nurse, also known as a nurse researcher, conducts scientific research into illnesses, treatment plans, pharmaceuticals, and healthcare methods with the ultimate goal of improving healthcare services and the lives of patients. In this role, you’ll design your own studies, analyze data within those studies, report on your findings and often, publish your results. Clinical research nurses typically work in universities, medical laboratories, or medical clinics. As this role will involve writing studies, grant proposals, and articles for medical journals, it’s ideal for individuals with strong writing skills. You’ll also need rigorous training in research methodologies and data collection. At minimum, becoming a nurse researcher requires a Bachelor’s degree, but many employers prefer that research nurses have a Master’s or even a Doctoral degree. Getting certified by the Association of Clinical Research Professionals is voluntary, but recommended. Psychiatric mental health nurse practitioners are certified advanced practice nurses who provide mental health services to individuals, families, groups, or communities. As they provide medical treatment, counseling, and emotional support for patients, psychiatric nurse practitioners have the opportunity to make a life-changing impact through their work. As nurse practitioners, they also take a holistic approach to healthcare, educating and informing patients and their families about mental health issues. Working as a PMHNP requires RNs who are compassionate, collaborative, and able to manage their emotions in stressful situations. Psychiatric mental health nurse practitioners typically work in mental health facilities, correctional centers, and private clinics. Like nurse practitioners, PMHNPs may also choose to work privately in their own clinics. To become a PMHNP, you’ll need to earn either a Master of Science in Nursing (MSN) or a Doctor of Nursing Practice (DNP), and receive board certification through the American Nurses Credentialing Center. Depending on the state you plan to work in, additional certifications may also be required. Due to today’s longer than average lifespans and a growing aging population, gerontological nurse practitioners are increasingly in high demand. GNPs address the specific needs of elderly patients, ensuring proper nutrition and safety, adjusting medication, and preventing rapid health deterioration. A gerontological nurse practitioner will generally work in a nursing home, hospice care, hospital, clinic, or other geriatric facility. As you’ll often be working with people in pain and those with chronic conditions, this specialty requires good communication skills, patience, and extensive knowledge of geriatric health issues. There are two types of adult gerontology nurse practitioners: Adult Gerontology Acute Care Nurse Practitioner (AG-ACNP) and Adult Gerontology Primary Care Nurse Practitioner (AG-PCNP). AG-ACNPs primarily focus on treating illness in inpatient or hospital settings, while AG-PCNPs focus on illness prevention and often work in community clinics or private practice. To practice this specialty, RNs must obtain an MSN or DNP and become certified by the American Nurses Credentialing Center or the American Academy of Nurse Practitioners. Also known as ICU nurses, critical care nurses specialize in providing care in hospitals’ intensive care units. They use their specialized training and experience to treat patients who are critically ill and at high risk for life-threatening health problems. In addition to measuring vitals, critical care nurses perform procedures, treat wounds, administer IV fluids, and communicate with patients’ families. To excel in this job, critical care nurses must work well in stressful situations, possess excellent decision-making skills, stay alert after hours of intensive work, and be prepared to experience life and death situations on a regular basis. Many in the field find that ICU nurses enjoy some of the most fulfilling work, intervening in critical moments in their patients’ lives—and as a result, making an impact that far exceeds routine medical care. Within the healthcare field, adult critical care units are one of the areas most in need of nurses— meaning that ICU nurses are highly in demand and well-compensated for their work. As a result, critical care nurse employment is expected to grow by 26% between now and 2020 vs. just 7% for all other occupations. While the average salary of an ICU nurse is $64,764, top earners can bring home as much as $93,717 a year. However, like most nursing jobs, your salary will likely depend on your location, level of experience, education, and certifications. Beyond having an Associate Degree in Nursing (ADN), no specific credentials are required to begin working in critical care, but to advance in this role, you’ll likely want to consider taking the CCRN exam. While a Bachelor’s degree is not required, many hospitals prefer to hire BSN candidates, or those who finish their degree concurrently with employment. If you’re interested in getting your BSN, Ameritech’s flexible RN-to-BSN program offers a fast and affordable online program that may be a good option, as it’s specifically designed to accommodate the needs and schedules of working nurses. Related Resource: What is Working in a Hospital Really Like? Orthopedic nurses provide a wide range of care for patients facing mobility issues due to disease, disorder, or injury. They assist in surgeries, provide physical therapy and rehabilitation, and help create prevention and wellness regimens. They also play a vital role in patient advocacy, providing education to improve patient health, prevent disease, and increase understanding about treatments. Orthopedic nurses typically work in orthopedic wards, though they may also practice in outpatient clinics, emergency rooms, or in communities. As they commonly work with patients with chronic pain, good orthopedic nurses have finely-tuned empathy skills. They also need to be great communicators to ensure that the healthcare provider is aware of their patient’s needs. If you’re an RN who’s hoping to become an orthopedic nurse, you’ll first need to gain experience in an orthopedic nursing practice. Additionally, most states require certification by the Orthopedic Nurses Certification Board as well. A clinical nurse specialist is a graduate-level RN who is certified in a specialty of his or her choice. Highly trained in their chosen area of subspecialty, clinical nurse specialists typically focus on education, research, and consulting. They provide expertise and support to nurses, help drive best practices, and ensure the use of evidence-based care. The best candidates for this specialty have solid critical thinking skills, strong attention to detail, and good leadership skills. Hospitals and institutions are increasingly looking to hire clinical nurse specialists, as studies from the National Association of Clinical Nurse Specialists have shown that CNS involvement in care results in reduced hospital costs, shorter patient stays, improved pain management practices, reduced medical complications, and increased patient satisfaction with nursing care. If you’re interested in becoming a Clinical Nurse Specialist, you’ll need to complete an MSN in a specialized field of nursing and additional CNS certifications may also be required. If you’re trying to determine what kind of nurse gets paid the most, we hope this post provided you with the information that you were looking for. As you can see, there are many nursing specialties that can help increase your salary, improve your job outlook, and put you in greater demand in the healthcare field. Although most specializations require additional training and education (typically starting with getting a BSN), it’s often well worth it for the higher wages and freedom to pursue the areas of medicine that you’re most passionate about. If you’re interested in higher earning potential and expanded career options as an RN, earning a BSN degree is often a great place to get started. 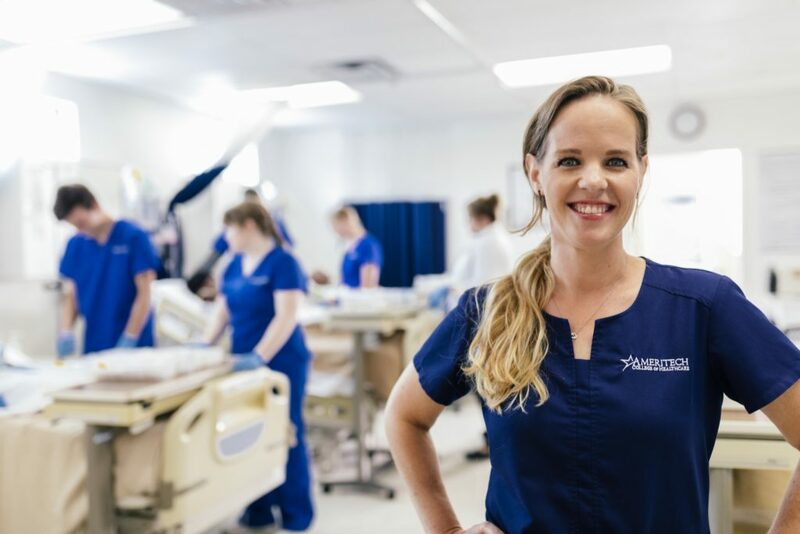 At Ameritech, our online RN-to-BSN degree completion program was created specifically for working nurses who require speed, efficiency, and flexibility. Our “all-in” tuition model allows you to earn your BSN degree at your own speed and on your own schedule. You can complete it in as little as 12 months or take as long as you need—all for one fixed, affordable cost. We even offer special scholarships and financial aid options for those who qualify. Interested in earning your BSN degree? Find out more about Ameritech’s online RN to BSN Degree Completion Program and how it can help you achieve your nursing career goals.